Europe, home to the mighty Alps and its mountain ranges, is a skier’s paradise. From the French Rhone-Alps to Swiss and Bavarian Alps, Europe offers myriad opportunities to grab a pair of skis and get the adrenaline pumping. After a rush of skiing down the incredible slopes, you can indulge in other snow sports like snowboarding, ice skating and ice climbing on your Europe adventure holiday. The snow-covered mountains, excellent climate and ease of reaching the far-flung snowy peaks make Europe one of the most sought-after skiing destinations in the world. On top of that, the flexibility to hop from one country to another without any hassle makes the skiing experience even more rewarding. Be it an expedition in just one ski resort or a tour of five or six resorts in different countries, here is a list of 10 best skiing destinations in Europe to help you plan your perfect winter holidays. The crowning jewel of Switzerland, Zermatt has outstanding slopes surrounded by the spiked peaks of Matterhorn. Zermatt holiday tours offer three interconnected skiing areas, each comprising its own variety of pistes and ski lifts that can be accesses using a single ticket from the township. Just across the Italian border, there are two more fabulous skiing zones with an unrelentingly stunning view and various vertical drops ranging around 7,000-ft. You should take a ride on the Matterhorn Glacier Paradise cable car, which is the highest in the Alps, and connects into the Cervinia area of Italy after descending 12 miles. Best suited for skiers who like to slide down the big mountains, Chamonix is internationally acclaimed for its extreme skiing, which is often described as “you die if you fall.” On the steep pistes of the deeply cleaved valley, you can feel adrenaline rushing through your body on your Chamonix adventure travel and tour. This town lies around the might Mont Blanc and is surrounded by other glacier-clad mountains of Alps. With only one ticket, you can get access to 11 different ski areas, some of which have vertical drops of up to 9,000-ft, located sporadically across the valley. The glamorous town of Kitzbühel used to be a medieval village, until its incredibly amazing slopes were discovered. It was transformed into a cosmopolitan and became the most popular ski destination in the Austria holiday package itinerary. Located in the Tyrol region, this town has some really dramatic slopes, offering great skiing opportunities in the Austrian Alps. The never-ending descents around the dramatic peaks of the Dolomites, the ski areas of Cortina d’Ampezzo are the world’s most beautiful. It is often visited by those who take note of aesthetic beauty of the area they ski in. And that’s the best part. As most skiers here spend a lot of time socialising over wines and delighting in the vistas, the pistes are less crowded. The ski areas, however, are spread out and if you want to add some variety to your adventure holiday in Italy, free shuttle buses connecting lift services around ski areas, taxis and cars are available. This around the year winter sports destination is home to one of the best ski resorts of Europe. In winters, this town becomes a gateway to the Jungfrau region, dubbed as “the Top of Europe,” that plays host to approx 150 miles of ski slopes. 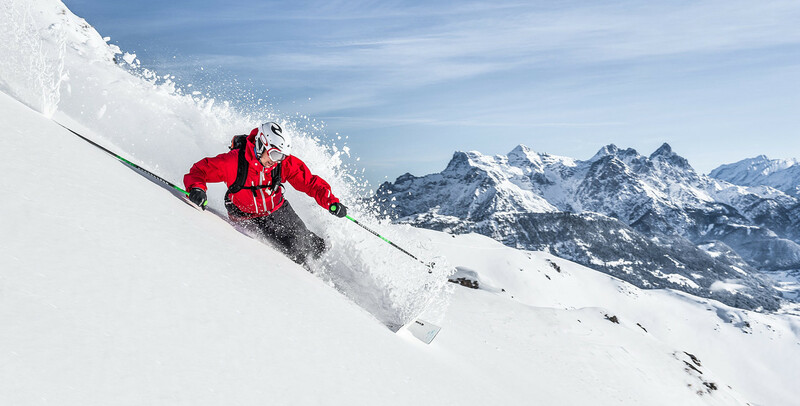 Grindelwald-First is a heaven for snowboarders, the Kleine Scheidegg-Männlichen area is boasts of awe-inspiring ski settings and Mürren-Schilthorn is renowned for its splendid panoramic views. With 300-km of pistes ranging from 1,550-m to 3,456-m, Val d’Isere in Savoie around the Rhone-Alpes is one of the best ski resorts in France. Its slopes are tremendously vertical and offer varied pistes for all sorts of skiers, beginners, intermediate skiers and experts. An exciting France vacation offers a lot of opportunities for a great skiing experience. This is a year-round winter resort and one of largest ski centers in Finland. Levi has around 50 slopes designated for novice and intermediate skiers, making it one of the best ski destinations in Europe. For the skiing aficionados, the resort has four incredibly challenging pistes. Apart from skiing, you can also indulge in other winter sports like cross country skiing, snowmobiling and dog sledding. Plus, the town’s close proximity to the Arctic gives you opportunity to discover the magnificent Northern Lights on your Finland adventure tour. The spectacular destination in the Swiss canton of Graubünden, St. Moritz draws a huge crowd glamorous including celebs to its fabulous ski slopes. In the upper Engadine region, you will find hundreds of ski instructors guiding thousands of novice skiers. While it is highly preferred by beginners, the experts need not worry as they will find plenty of challenging pistes around the area. This charming Austrian resort lies close to the Salzburg airport, which is an hour and half drive away. The lofty position of Obertauern and an elevation of 1,740-m atop the Radstädter Tauern Pass receives inches of snow every winter. The lift takes you up to an elevation of 2,313-m from where you can slide down the intermediate slopes of about 100-kms. The best time to enjoy Austria adventure tour is during the skiing season that starts around mid-November and lasts up to May. Located in the centre of the French Alps in the Rhone-Alpes region, Courchevel is famous for its more than 100 ski runs suiting to the likes of ski fanatics. It is a heaven for skiers with its better than perfect pistes of different levels scattered across magnificent slopes. Some of the areas are even dotted with moguls, making a great track for snowboarding and snowmobiling. Other popular winter sports in the Savoie, France are ice skating, ice climbing and tobogganing.